'We could have done 15 deals in India if we wanted to': Trump Jr.
"I rather build something great, deliver it on time, make it a success. That is much more important than arbitrarily saying I need to be in this town because that is the only town that matters," said Donald Trump Jr. talking to Business Today. 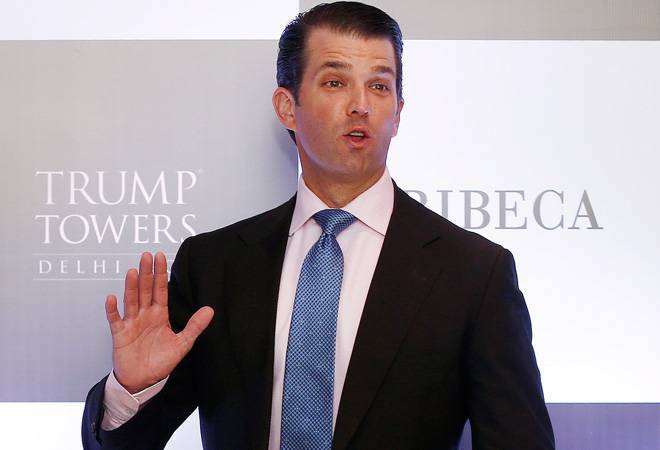 Donald Trump Jr., the eldest son of POTUS, is touring India to promote the Trump Organization's luxury real estate business in the country. The 250-unit Trump Towers Delhi-NCR launched in January this year and has already clocked Rs 700 crore in sales revenues; the average unit cost is Rs 7.5 crore. The project is being co-developed by Tribeca and M3M. In the run up to Trump Jr.'s visit, newspapers buzzed with large advertisements that invited home buyers to a dinner and conversation with him. Trump spoke to Business Today's Rajeev Dubey and Goutam Das on his interest in India. Q. The interesting ads in newspapers. Is this something you do in other parts of the world as well? Trump: Is it different? This is real estate development. We are talking about business. These are all very normal things to do. With the success we have had, we are going to tap that. We have been a believer in this market for a very long time. Many of you have covered me 10 years ago speaking in real estate conferences saying it is going to be a big market for us. It took a little while to break through. To figure out who is real, and who isn't. Who you can actually do business with and who is somehow hoping to get involved. That's been a big learning curve. But it has been exciting and its great to be here now with the successes. Q. What we meant was the meeting with buyers. Is that unusual? Trump: I think if I didn't meet with buyers for a project, I would be the first real estate developer in the history of real estate to not do that. That's what it is. When you are a brand, part of that brand has a personality. You interact with your buyers, you form those relationships. No different than the relationships we have with our business partners. It's a relationship game. I have done that for every project we ever developed. Q: How do you see the market for luxury real estate evolving in India? Particularly, how has it evolved for you in the last 10 years? Trump: Its been a big change. A big part of some of our success is that we have not just talked about luxury but actually delivered it. People experience luxury in New York, in London, and In Paris, and then they come back to the best of the best in their market and it was not the same. As people became more successful, had more money, experienced rest of the world, they were starved for luxury. Meaning, they experienced when they were away from home but they couldn't get it at home. The market would figure out very quickly if you are saying you are going to do this but you don't. If you took our tower in Pune, and put that in any other city in the world, it is an amazing product. That wouldn't have been the case 10 years ago. We would have been much more reluctant to do a deal. You can't make things apples to apples with New York without being able to spend accordingly. When you commit to doing that and you start delivering it, that makes a difference. Our buyers get that. They have confidence we are going to do that. The premiums we are achieving are pretty substantial. Q. How come you started with Pune (Kalyani Nagar) and not one of the larger cities? Trump: When I met Atul and Sagar (Chairman and Director of Panchshil Realty, the developers) and became friendly with their team, our interests were aligned. We understood each other well. For me it wasn't about rushing in. When you are a brand, and a luxury brand, you cant just attack every deal that shows up. It can work once, or twice, but probably won't work too many times after that. I rather build something great, deliver it on time, make it a success. That is much more important than arbitrarily saying I need to be in this town because that is the only town that matters. It was really more about the people, the partnership, more about the end product that would set a benchmark for what we would represent as a brand in India. That project did an incredible job of doing that. Q. Demonitisation de-railed the India real estate sector. How do you see its impact? Trump: There will be short term hits to the market but it would ultimately lead to strengthening the future. You know the stories as well as I do - how real estate used to transact even a few years ago. There was the asking price, the official price, and then there was what people show up with on the site. As it related to consumer confidence, you needed to eliminate a lot of that for people to understand what they are going to get. That may have short-term pitfalls but in the end, it is going to strengthen that market; weed out a lot of the bad players - there were plenty of them. Developer was a four-letter word in many respects. If you weed out the bad ones, the good ones will thrive and the market will ultimately succeed. That will matter for the future and will certainly matter as it relates to investments coming in from abroad. Q. You can't sign new international deals (till Donald Trump is President) but which city besides where you already are has an appetite for luxury real estate? Trump: There are a lot of opportunities and frankly, there were a lot of deals we were talking about, even for months that just weren't over the finish line. They weren't signed, and we said we can't do them anymore. There is a reason I have been here for a long time cultivating those relationships. We could have done 15 deals in India if we wanted to by the end of this year - if we were able to do those things. But we have self-imposed rules. But with that comes a significant opportunity cost of what we are turning down. But that's okay. We are still a big believer in the market. Whenever that time comes, when we can get back into those deals, we will look forward to doing it because we were a believer then, and we will be in the future. Q: How does this embargo work internally in the Trump organisation? Trump: We are just not doing international deals. Trump: It is more complicated than that. Q. How are you silo-ing it from the Presidency? How does that work internally? How do you action it? Trump: My brother and I run the business. People are saying my father is running the business - crazy! He has got so much on his plate he wouldn't be even interested in it at this point. We make decisions. Q: You don't take advice from him? Trump: Honestly, there is no time. I would love to have him there as a sounding board. But when I talk about the things that he is doing, the importance and the gravity of the situations and decisions that he has to make on a daily basis, I can't say, 'Well, do you think we should sell it at a little lower or a little higher?' It is ridiculous. I don't speak to him often because frankly, I'm embarrassed to call. Because there is never something that is not a big deal that's not going on.